Tomato-basil, spinach-feta and apple strudel pretzels. Ever sit at your desk with a rumbling stomach wishing your office had sandwich delivery like in old movies? Or that some kind of lunch fairy could bring you food? Turns out that is a thing that can happen, but with a twist. Well, a lot of twists. As in pretzels. No, not the gangly ropes of dry bread you gnaw at a ballgame. These are plump knots of soft, warm dough that stretch apart in a way that reminds you why you haven't given up gluten. 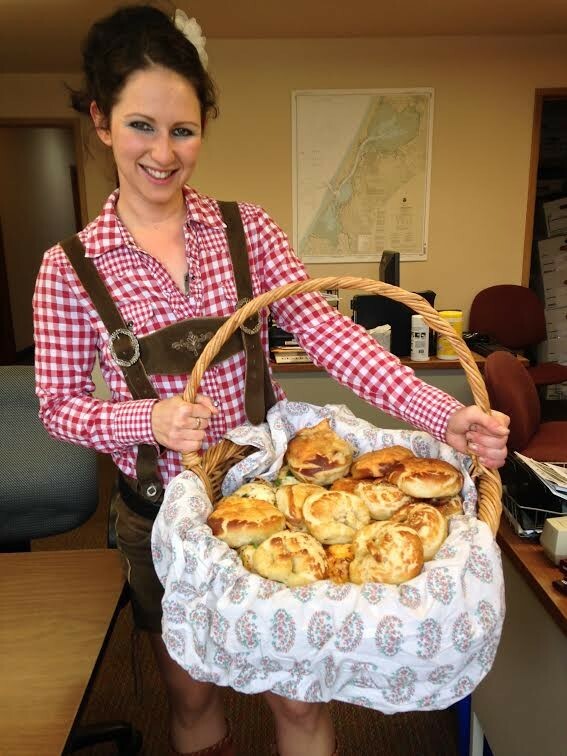 Get an order of 10 or so together and Royal Bavarian Brezen (476-3920) will show up in the form of Alexandra Hierhager, the lederhosen-clad, basket wielding woman who wakes at 4 a.m. to bake her mother's recipe from (surprise) Bavaria — a magical land of mellifluous German and bountiful pastries. Frau Hierhager mit ihrem Brezeln. The basic salt pretzel ($3.50) satisfies like a bagel, but the other varieties are legion. The basket overflows (that woman is stronger than she looks) with savory and sweet options from jalapeño to chocolate and peanut butter ($4.50 or three for $10). Both the tomato, mozzarella and basil pretzel and the spinach, feta and Monterey jack one are generously topped and as satisfying as sandwiches. 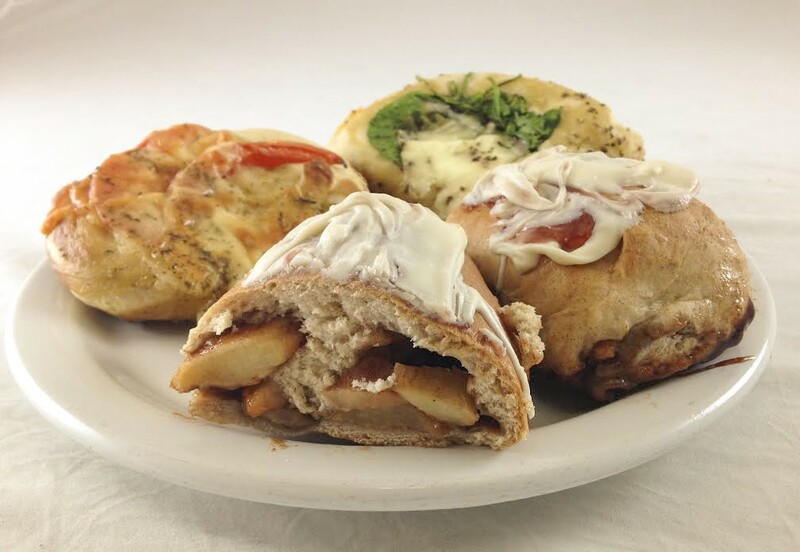 The apple strudel pretzel is full of cinnamon and fruit, but with a bagel's chewiness and vanilla frosting. 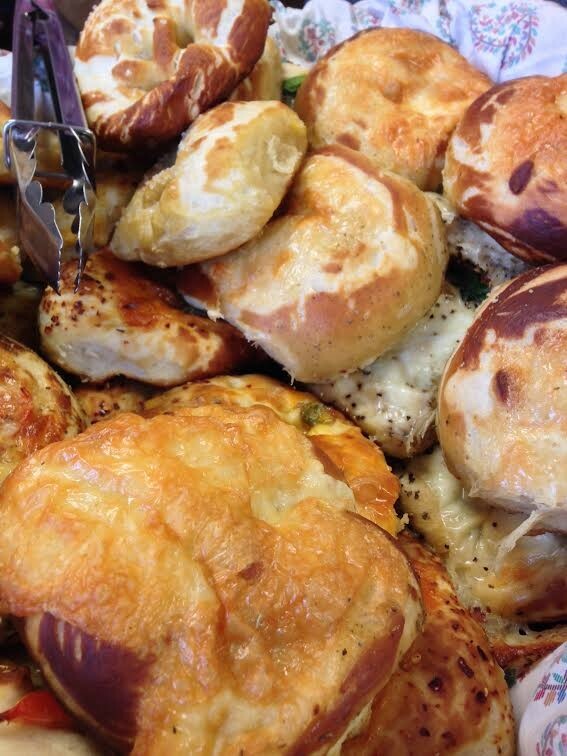 Eating a pretzel lunch is the team building exercise your office has been waiting for. A basket of Bavarian bounty.